Easter is nearly here, and I've added a few touches of Easter decor to our home. Our dining room table holds my mother's Easter egg collection. My mom died in 1999, so this collection is very special to me. This year I have the eggs resting right on the tabletop. Instead of my usual blue and white planter, I've used an Easter basket to hold a plant. Plus I added a little friend to the greenery--can you see him? 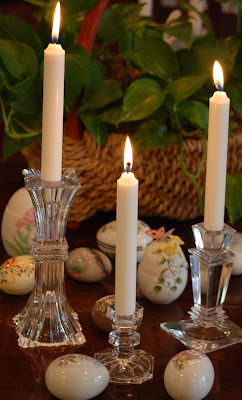 Some crystal candlesticks finish off the simple tablescape. The table in our breakfast room is not a good spot for centerpieces, since it's usually being used for eating, homework, or LEGO building (or all three!). So the dough cabinet that stands beside the breakfast table is a favorite spot for holiday decor. As a final touch I added this wonderful cross sent to me by my wonderful friend Dawn from Beyond Grace. Recently she sent me a package filled with wonderful goodies; this cross was one of them. If you don't already know Dawn, you should check out her blog. Her writing will inspire you! Very lovely and very sentimental tablescape. Your mother's Easter egg collection is so pretty and very special to you. 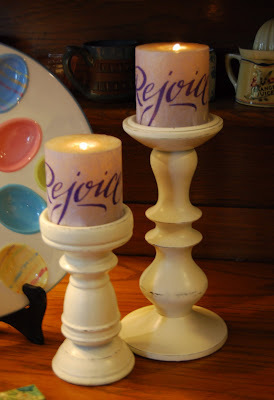 The crystal candle sticks are so elegant and your decor by the breakfast cabinet is beautiful. HAPPY EASTER to you and yours. Everything looks so lovely Richella and how special to have those eggs from your mom! I know you treasure them and they look beautiful on your table. :-) Thanks for sharing this at the Bunny Blog Hop! Love that flop-eared bunny peeping around the flowers and I appreciate your honoring the spiritual meaning of Easter --our risen Saviour. Richella...I feel like I was just welcomed into your home. You asked me to tea, and while you are getting it, I am looking around at all of your pretties! I love your mom's egg collection..how special! I love the bunny peeking from the basket....and also love the jars of jelly beans. Love the lit candles in the pretty candle holders...they are adding ambiance. I love how you thoroughly enjoy all that God has given you...and how you share it with others! You have the gift of hospitality! Thanks for the nice visit over tea and cookies. i love to read about and see your mom's treasures. bittersweet and lovely... and i see that little lego basket and started thinking- how quickly could i find one for cam?!?! i'm really glad you like the cross :) i love you, grace-girl! Beautiful job on the Easter decor! Such pretty decorations! The cross is so unique and I am sure your son made the lego basket!! The bunny laying down on your hutch is so cute -And what a special collection to remind you of your mom - Enjoy this special holiday! It's looking so cheerful and spring-y around there Richella! I hope you and your family have a wonderful Easter week.